We’ve all been there. Well, if not personally, we know someone who has. The shoes come off and an unpleasant odor fills the air. It’s natural. Feet and hands contain more sweat glands than any other part of the body (about 3,000 glands per square inch). This biological fact and two other reasons conspire to create the problem: shoes and sweat. The interaction between your perspiration and the bacteria that thrive in your shoes and socks generate the odor. Thus, foot odor and smelly feet. 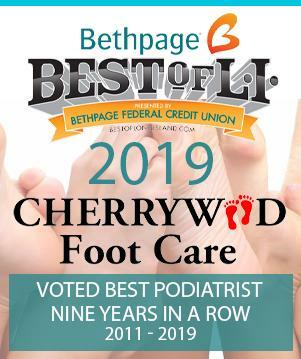 If you want to remedy this embarrassing problem, Cherrywood Foot Care recommends you address both the sweating and your choice of footwear. Smelly feet can also be caused by an inherited condition called hyperhidrosis, or excessive sweating, which primarily affects males. Stress, some medications, fluid intake and hormonal changes also can increase the amount of perspiration your body produces.